Were you one of the lucky ones who picked up a bargain from Macy's last month? 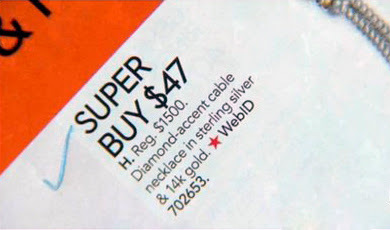 Instead of being offered at $479, a $1500 necklace was advertised in a mailer at just $47. But you had to be quick. One customer in Plano, Texas queued at his local shop in Collin Creek Mall only to see the person in front of him buy up its entire stock. Apparently, the company could offer no explanation as to how the mistake was made. Perhaps I can help out here, Macy's. You didn't read your proof properly.